SpionKop Lodge is situated against the majestic backdrop of the Drakensberg Mountains, on the KwaZulu Natal battlefields route. 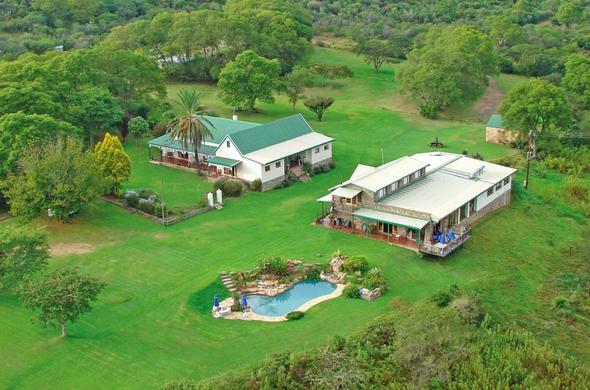 Renowned for being the perfect base for exploring the berg, bush, birds, and battlefields of the region, Spionkop Lodge offers visitors an awesome sense of space and beauty with supreme comfort and warm hospitality. Accommodation at SpionKop Lodge is in colonial style chalets located in the park-like grounds, each independently furnished and appointed to offer comfort. All chalets have en-suite bathrooms with an out of Africa decor. Activities at SpionKop Lodge include birding watching safaris which can easily be arranged through the Lodge. Embark on a tour to learn all about one of South Africa's bloodiest and most futile battles - the South African War of 1899. Other activities at Spionkop Lodge includes hiking, canoeing and fishing ensures that your visit is as action packed or relaxed as you make it. The business fraternity has the opportunity to gather at the Lodge's modern, well appointed conference centre. Whilst happy couples can be guaranteed of an unforgettable Wedding Day by tying the knot at a really special venue.